You'll see a great writer resume in a second. You'll then write a better one. Painful. Messy. And you soon regret having started. It's the hardest writing gig of all. But don’t worry. We’ve got you covered. A writer resume sample better than 9 out of 10 other resumes. How to create a writer resume even if you have no experience. Tips and examples of how to put skills and achievements on a writer resume. How to describe your experience on a resume for writing positions to get any job you want. Sample Writer Resume - See more templates and create your resume here. For general proven tips on how to write the perfect writer resume, read on! What’s the Best Format for a Writer Resume? Something that screams: "beginning, middle, and end." You know that your readers have the attention span of a goldfish. The same is true for recruiters. You need to get your message across fast and nothing works better than the reverse-chronological format. On average, they spend six seconds scanning the text. True story. So, start from the most recent work experience. Work your way back to the beginnings of your unequal struggle with writer’s block. Alternatively, you can consider the functional or combination resume format. When should you use them? If you did a lot of similar things for different clients—and for a longer period of time. People working as freelance writers, copywriters or grant writers face this problem. In this scenario, what you can do matters more than when you did it. Use a clear, legible typeface, big headings, generous white space. All these formatting steps make your writer resume neat and easy to follow. 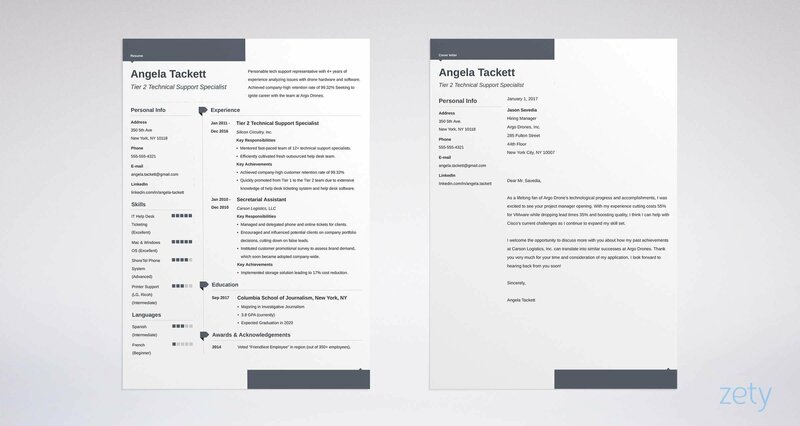 Finally, save your resume as a PDF file. This file format keeps the layout intact and is scannable by ATS software. Also, keep a copy of your resume in the good old MS Word .doc file. This will save you if it turns out that amazing company doesn’t accept PDFs. Pro Tip: Check the job offer to make sure that PDFs are accepted. Some companies still use older Applicant Tracking Systems that can parse writer resumes saved as .doc files only. For more tips on how to choose the best writer resume format, read: The Best Resume Format: Chronological, Combination or Functional? Writer Resume Summary or Resume Objective? Use all your creative forces to start your resume for writing jobs with a blast. Meet Brad. He is a recruiter looking for a creative content writer. He’s got 200 copywriter and content editor resumes on his desktop. All these writer resumes look the same: I’m a writer and I write.. So, how is your professional writer resume going to make it to the “yes” pile? Start with an earthquake—a professional writer resume summary or objective. If you got years of writing experience, choose a writer resume summary. Outline your path in professional writing and highlight your most impressive wins. Awards go here!. If you are just starting out in the world of writing, pick a resume objective. Briefly describe skills you’ve mastered so far and mention how valuable a hire you’ll be. This is the earthquake Brad is craving. Let’s have a look at some writer resume examples. Copywriter with 6 years of commercial experience in marketing departments of online fashion companies. Familiar with SEO copywriting and cold email writing. Versatile copywriter with 6+ years of online marketing experience. Skilled in writing top-ranking fashion & lifestyle articles and converting copy for landing pages. Wrote copy for Posh Cat’s Black Friday landing page and newsletter that generated 7k leads and 400 sales of their high-end products. Seeking to leverage excellence to dramatically increase traffic and conversions from content marketing campaigns at Elegance Unlimited. The first copywriter resume example is too short and unspecific. This could be anyone. “No” pile on Brad’s desk. The second one? This writer resume summary is tailored to the job description and clearly shows you understand the bottom line. Applying for a job as a technical writer? Experienced technical writer skilled in creating documentation in the IT industry. Fluent in using relevant software programs. Willing to further develop professional technical writing skills. Detail-oriented technical writer with 5+ years of experience writing high-quality internal and user-facing support and learning documentation. Single-handedly authored a 90-page user guide for a cloud-based webinar app. Seeking to efficiently explain highly complex systems and processes to Pear Inc.’s customers. The first technical writer resume summary? Reads like an attempt at explaining to grandma what it is that you do for a living. The second tech writer summary… Well, it speaks for itself with relevant industry jargon, numbers, adjectives, and details. Good job! Now let’s move on to two very different sample writer resume objectives. Entry-level freelance writer with a Bachelor's degree in English. Willing to train on the job. Interested in blogging and social media. Passionate writer with a BA in English from the Ohio State University. As a volunteer content writer for local Their Chance animal shelter, created and managed the “Home Is Where Your Human Is” official blog and Facebook page that helped 84 dogs and cats get adopted in three months. Seeking a junior content writer position with XYZ where I could use my blog writing and social media management skills to engage customers. What’s wrong with the first example? All it says is “I know how to write in English. Teach me everything else.” Okay, it’s more than good to be willing to learn. But this focuses on your personal gain—and not on the employer’s profit from mentoring you. The right freelance writer resume example shows you can do things with words even though you’ve only started. This is key to writing a good writer resume objective—show the recruiter what you’ve got and how they can profit teaching you more. Pro Tip: Drop personal pronouns from your writer resume summary or objective. You will focus more on the prospective employer—and they will picture you achieving great things for the company. It works like a magnet, but it’s the last thing you should work on. It will hook your readers and make them want to read the rest. Don’t focus on how much you wrote. Focus on how well you wrote it, who published it, how many people read it, what awards or accolades you earned. Use the reverse-chronological order. Describe your experience starting from your most recent position. Move backwards until the last position relevant to the writing job you’re applying for. Use bullet points. For each job, add up to 5 bullet points describing your writing or editing duties. Showcase your formatting skills. Use keywords from the job listing. Strategically place these important words and phrases in your work experience section. Choose only what’s most relevant for the position you’re applying for. Tailor your resume to the employer’s expectations. It works miracles. Add key achievements as a small subsection. That Pulitzer Prize? Mention it here again. Show off your other biggest wins such as cover stories or most recognizable magazine titles. Responsible for writing and editing lifestyle articles published online. Cooperated with a team of video and photo editors. Participated in sourcing and training content writers for foreign language versions. No bullet points. No specifics. Boring. No one’s gonna read this. Authored 90+ unique lifestyle articles published on 6 websites that attracted over 8M unique visitors. Increased visitor dwell time by 26%. Sourced and coached 4 content writers for the Spanish version of YourLifestyle.com that built its traffic from 0 to 1M in five months. Key achievement: Wrote a script and copy for a YouTube video “27 Tricks To Look Smarter” that got over 15M views in a week and was picked up by BuzzFeed. Numbers, action words, achievements. All check. Your recruiter searching for your video on YouTube. Check. Researched studies for the purposes of the grant applications. Wrote 3 successful grant applications that received $160,000 in funding. Created a long-term state, federal and private funding portfolio with the Lead Grant Writer. Compiled a comprehensive resource of expert publications and case studies on sustainability and waste management to support the grant application writing process. Key achievement: Authored a top-rated grant application in the Sustainable Today local government grant program. Pro Tip: Don’t skip months describing your work experience. This falsifies your employment length. Whew, time for something easy. If you are a writer with at least a few years of professional experience, listing education on your resume will be as easy as writing a shopping list. Writing a beginner writer resume? Include relevant courses, academic achievements, and extracurricular activities. If you are an entry-level writer, you can even list your school newspaper here. Recruiters hiring writers with no work experience pay special attention to the education section of their resumes. Proven. Pro Tip: If you graduated from college, forget about sharing your high school GPA. Always go with the most recent institution. Unsure what education details to put on your writer resume—and what to skip? Read our article: Education on a Resume: What to Include and What to Leave Off. As can a monkey with a typewriter. If the dreaded MS Word cursor never blinketh when you work, cool. Include that on your writer resume. Impressive as it may be, proving it is another story. When creating your writer resume skills list go for skills that are relevant to the job opening and can be proven by your certifications and portfolio. The situation gets more specific and complex when writing a resume as a copywriter, content editor, or blog writer. I can’t stress that enough—the skills section of your writer resume should outline entries that match the job requirements first. Pro Tip: You can put skills on your writer resume in bold, for example, "SEO editing." It will help you draw the recruiter's attention while they are scanning, and make them remember you. Congratulations, your professional writer resume is 90% ready. Where is the last 10%? In additional sections that you can add to kick it up a notch. Meaning, to prove your best assets. But what if you don’t have any of the other items from this list? Take an extra online course, go to conferences, take part in a writing contest, write a guest post, get active on Medium, LinkedIn, Twitter, or Facebook. It will only do your professional writing career—and your professional writer’s resume—good. Pro Tip: If you decide to add hobbies, skip irrelevant and odd ones that don’t translate to the job. Like mushroom hunting or watching Corgi races. They simply take up valuable space on your otherwise creative writer resume and add no value. How About a Cover Letter for a Writer? You might have heard that cover letters aren’t important anymore. Well, the truth is that as much as 40% of hiring managers won't read a resume if there's no cover letter attached. This means that if you don’t write a cover letter, you decrease your own chances of getting an interview invitation by… 40%. If you’re creating a copywriter resume or a resume for other writing jobs, attaching a cover letter to your application will double your chances for success. Show that you understand what the job is about. Outline your most relevant writing experience and skills that make you the best candidate for this position. Finally, mention that you share your writing samples or even a portfolio with the application. Pro Tip: The only case you can skip writing a cover letter is when the job ad explicitly states not to submit one with your writer resume! Start your writer resume with a skillfully written resume summary or objective. In the work experience section, describe your accomplishments and duties using action words. Sprinkle this with numbers whenever possible. List those of your skills that are relevant to the writing job you’re applying for. Showcase your breadth and passion by adding "other" sections to your resume. Publications, awards, conferences add depth to your professional writer’s profile. All check? Well then—you have a great writer resume ready to land you that dream job! Still not sure how to make the perfect writer resume?Got more questions? Need further help? That’s great! Let us know in the comments and we’ll get back to you. We love to help! Paulina is a career expert with extensive experience in communication, effective personal branding and career development. At Zety, she writes guides that help you cope with all the difficulties of job search, ace your job interviews, and manage your career.